But tobacco industry interference in health policy as well as in WHO FCTC has been a major challenge, and impedes efforts to prevent diseases and avert untimely deaths caused by tobacco use. The tobacco industry has historically employed a multitude of tactics to shape and influence tobacco control policy. The tobacco industry has used its economic power, lobbying and marketing machinery, and manipulation of the media to discredit scientific research and influence governments in order to propagate the sale and distribution of its deadly product. Furthermore, the tobacco industry continues to inject large philanthropic contributions into social programs worldwide to create a positive public image under the guise of corporate social responsibility. 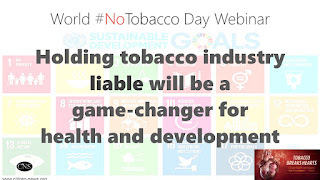 The global tobacco treaty adopted by over 180 countries globally, has evidence-based measures to advance public health and corporate accountability. Among the backbone ones, is WHO FCTC Article 5.3, the first Guiding Principles of which is: "There is a fundamental and irreconcilable conflict between the tobacco industry's interests and public health policy interests". But tobacco industry continues to find deceptive and insidious ways to water down or delay or jeopardize health policy making. Holding tobacco industry liable (WHO FCTC Article 19) could be a game-changer step forward towards public health as well as corporate accountability. If we are to deliver on promises governments made by committing themselves to the UN Sustainable Development Goals (SDGs), then 'business as usual' is clearly not an option. Saving untimely deaths from preventable causes such as tobacco, is a compelling public health imperative. This World No Tobacco Day 2018 webinar is dedicated to the memory of our mentor, colleague, friend and inspiration: Yul Francisco Dorado, a fearless tobacco control and human rights leader from Bogota, Colombia, whose timeless legacy continues to guide us in our work. 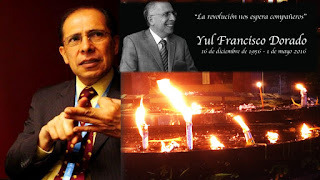 Yul was the Latin America Director of the Corporate Accountability and part of Network for Accountability of Tobacco Transnationals (NATT) leadership.